A revisit to the Grant River, this trip was a perfect example of how perspective shifts as time goes by, for what had initially felt somewhat anticlimactic years ago today felt like an out-of-the-park home run and one of the most scenic paddling experiences ever. This is a very recommendable level. We recommend a minimum of 175 cfs because much lower and you’ll encounter some scrapping. Time: Put in at 11:05a. Out at 2:00p. Wildlife: Cows and bulls, deer, bald eagles galore, a gazillion fish (colorful suckers for sure, maybe some trout), muskrats, turtles, a baby snake, a huge beaver, sandhill cranes, wood ducks, deer scampering up tall bluffs, a flock of at least two dozen pelicans soaring and circling at least a thousand feet high, swallows, songbirds and one (probably rabid) bat. This was our second time down this stretch of the Grant River, the first occasion being late in November 2012. As you’ll see, we have no photos from that trip. Between the lack of mechanical memory and paddling that trip late in the year and at a very low water level, it had remained kind of murky, our remembrance of its specifics not entirely reliable. Together with the upstream trip of the Grant River, we wanted to redo the Grant and set the record straight. So we dedicated a weekend to paddling both sections again, which we strongly recommend. With that in mind, we feel that there’s some inaccurate and perhaps outdated information out there on the Grant River. For one thing, the eminent Mike Svob writes about two trips on the otherwise long Grant, saying nothing about alternative options. This artificially designates the Grant in only two profiles: Grant River 1 (Short Cut Road to Blackjack Road) and Grant River 2 (Blackjack Road to Chaffie Hollow Road). The conventional wisdom is that the first section has more rock formations but is less riffly, while the second has fewer rock formations but more riffles. Frankly, we just don’t agree with that past assessment. For one, the first trip is loaded with riffles and swift water. It may not have the 2-3 actual rapids that the second trip has, but we experienced shallower conditions doing the first section than the second even though the gauge read exactly the same both days. For another, there is no shortage of rock formations on the second section. Are they less dramatic or picturesque than the first section? Maybe, but that’s a very difficult comparison. Besides, the second section has a spectacular weeping seep and a cool grotto you can clamber into. 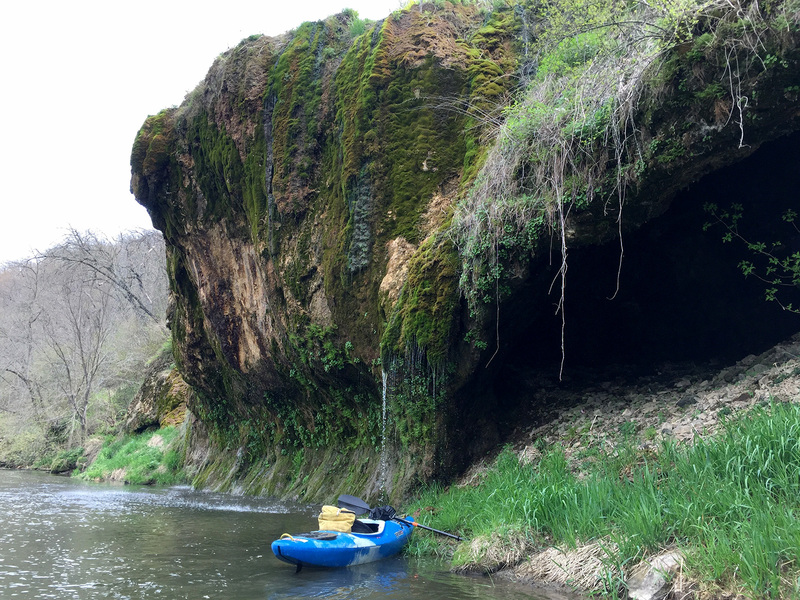 To be sure, the two trips have distinctly different feels – indeed, we liked this section more than the first – but do keep in mind that they’re both wonderful paddling trips. Another revision we’d like to address: this trip starts off great for half a mile (riffles, rock walls), then becomes monotonously agricultural for about two miles. After this – and for the remainder of the trip – things just get better and better, quieter and more intimate. In our previous report for this section we put too much emphasis on the farm fields and cattle pastures. The river does meander quite a bit here, and there are fields everywhere. But the surrounding vista is just gorgeous, as you’re surrounded by tall bluffs in every direction framing the backdrop. Plus there are many lively riffles in the “ag dep’t”, and this time around (early spring vs. late autumn) there were frisky fish flopping and darting every which way in the shallows, a phenomenon we never tired of witnessing. So while this 2-mile segment isn’t as strikingly scenic as the rest of this trip, it’s still plenty pretty. Lastly, there is the issue of access and private property. Mike Svob tells a cautionary tale about the put-in and takeout being owned and operated by private outfitters. We don’t know for certain if that info is still up to date; there are no signs stating this. But to be on the safe side, and as a courtesy to other paddlers, leave your vehicles at the landings in such a way as to allow others to access the water. At the Blackjack Road landing this means parking as far to the right as possible, and ideally not underneath the bridge itself (the bridge is County Road U, for point of reference). This will allow a would-be outfitter with a trailer the space to turn around. There’s a lot more levity at the Chaffie Hollow Road landing, which essentially is an open field where the river bends around a tall bank about 30 yards upstream of that bridge (here the bridge is Chaffie Hollow Road). There’s a sand-gravel spot that’s perfect for putting in or taking out. Even my low-clearance VW Golf could “off-road” the landing here. But again, just be mindful of other vehicles when you park your own. In a nutshell, the water is nearly crystal clear, the current lively and engaging, the geology just stunning. That’s the Grant River. The first half-mile will unhinge your jaw, as riffles whisk you past a knockout rock wall and other outcrops on your left. Then you’ll enter the “ag order” section, which features a series of meandering loops past crops and pastures. Bluffs predominate the backdrop, and riffles will command your attention so as not to get bored. After this 2-mile stretch the river will begin to feel wild again, and there will be rock outcrop stretches one after another, sometimes on the right, sometimes on the left. You’ll pass a couple haunting hollows too, which if you have the time and curiosity, invite an on-foot exploration. It’s the Grant River; there must be morels about, in season, and fiddlehead ferns – watercress is a good bet. Also, you’ll pass a couple moss-strewn cliffs that were visibly moist and quietly percolating. After recent rain, these would be even more dramatic displays. What made this trip a 5-star experience rather than a solid 4 is the section from the Camel Ridge Road bridge to the takeout (roughly the last third). To begin with, there are solid “rips” (kind of a hybrid between riffles and rapids) beneath the bridge itself. Immediately on the downstream side is a unique sandstone ledge about 2-3’ above the water running for some 15 yards. Most of the rock formations along the Grant are limestone, but this is one of the notable moments when sandstone makes a cameo appearance. To be expected, it’s been defaced with hand-carved graffiti; we were tempted to carve “Miles Paddled wuz here” or at least stencil in the pirate logo, but we left it be. This is then followed by the first real Class I rapid of the day, which in turn is followed by a spectacular weeping seep. The seep itself, about 20’ high, is at the base of a much taller bluff. Water comes from… somewhere. (A disappearing stream from within the bluff?) When we first paddled this in November 2012 there was still a trickle dripping into the river below, despite very dry conditions and low water at the time. This time, in April 2016, while still dry (for spring), there were cascades of water coming from above in what can only be described as a shower. It would be an exaggeration to call this a waterfall, but you can paddle into and behind the water falling from above. In fact, we highly recommend it. How often can you do this while paddling? And on a hot day, trust us: this water is incredibly refreshing! You don’t want to drink it, as it’s probably coming through porous limestone, which is ridiculously acidic, but it’s fun to get your hair and face wet! Immediately to the right of the seep is a cool (in every sense) grotto you can explore on foot. It’s only about 15’ wide, so maybe “explore” is too strong a term. But it’s pretty damn neat. Again, how often can you do this when paddling rivers? After this is an even better stretch of Class I rapids. All of these features lie within half a mile from the Camel Ridge Road bridge. It’s both gorgeous and glorious. The remainder of the trip features a few more rock outcrops here and there (more modest than upstream), some riffles and just very pretty bluffs at every bend. Pastures come back into view, but less domineering than in the beginning of the trip. There’s one last easy little rapid and row of small standing waves past a modest bluff on the right leading to the takeout area on the left. The Chaffie Hollow Road landing is about as beautiful place to finish a trip as can be imagined. The two miles of meandering farmland in the beginning. It’s a little monotonous and lackluster relative to what else there is to experience on the river. We didn’t dislike it per se; it just sticks out in comparison to the supremely gorgeous parts. If there is one thing we didn’t actually like it’s the intermittent stretches of surprisingly flat water where there is virtually no current. If there’s a way to turn this frown upside down, then let it be this consideration: whereas nearby rivers like the Galena and Platte quickly drain and can frustrate the unsuspecting paddler by entering scrape city or, worse, the walk of shame, the Grant holds its water surprisingly well, admirably so. This may well be on account of the intervals in the gradient between steep and flat. But these “complaints” about the fields and the flatwater are petty when put in the greater context of how outstanding this trip is. We already want to do this again! The only thing we’d do differently is consider adding another 3 miles by taking out further downstream at County Road N, in Burton. Otherwise, this is an outstanding daytrip. 4.3 miles. Chaffie Hollow Road, while very steep, is exceptionally pretty and runs parallel to an intermittent stream tumbling down the bluff. After a hard rain you’d see small waterfalls here and there. The put-in under the County Road U bridge. Glorious rock walls in the first half-mile. Two miles of pastures after the rock wall. Line of sandstone with riffles just past Camel Ridge Road. We refrained from carving “Miles Paddled wuz here”. Twenty feet high and dripping in at least six different spots. Light rapids immediately follow the seep. More charismatic rock outcrops along the way. A flock of at least 40 pelicans several hundreds of feet up in the air. A tall and pretty eroded sand bank near the take-out. One last light rapids on approach to the take-out. The take-out upstream of the Chaffie Hollow Road bridge. Baby snake (but baby or not, it’s still a snake – gah). The best of the southwest, this segment of the Grant offers more riffles than stunning rock outcroppings (though it’s not lacking in the latter) and is more cow country than hidden canyon lands but it is every bit as beautiful as the upstream section. Time: Put in at 1:30p. Out at 3:30p. Wildlife: At least nine spottings of bald eagles, a couple hawks, circling turkey vultures and five leaping deer scrambling up the bluffs. A cloudless 60-degree day before Thanksgiving and a day off inspired me to drive two hours to one of my favorite rivers in southern Wisconsin. Everything went wonderfully but for the fact that I lost my camera at the takeout. I left my bicycle to pedal back the shuttle route after the paddle, so I never did take any pics of this trip except for two at the takeout (both of them absolute beauties of the parking area and landing). Incidentally, if anyone finds a Panasonic Lumix camera at the takeout, ideally before the first snow, kindly email me, wouldya? Notwithstanding the speculated prohibitions about access mentioned in the Grant River I write-up, there are no restrictions or trespassing signs at the take-out. That said, both landings are privately owned and maintained by a local outfitter, so please be considerate and respectful and don’t park your vehicle in a way that blocks their shuttle access. Both landings are just about perfect and well-kept, let’s keep it that way. The trip begins immediately with a huge bluff with pretty rock formations. The next two miles are the most winding of this trip as you zigzag around bull pastures. Generally speaking, the banks are too high for the big old beasts to do anything than stare at you or maybe trot alongside to prove to the others he’s got it covered. Because the river course is so crooked here, it behooves you to pay more attention to the angles than the Angus (sorry bout that pun). The river straightens out some in long graceful s-curves, each about a mile in length. You can shorten the trip by taking out at the Camel Ridge Road bridge at the 5-mile mark, but you shouldn’t! Not only because there’s more loveliness awaiting downstream (riffles and rock walls gnarled like ghoulish masks) but one of the prettiest damn features you’re likely to encounter while on the water; a moss-strewn overhang off a rock face so dripping with runoff that one can only call it a waterfall. Here’s where I really regret not having that camera! Technically called a “seep,” it was positively serene and arguably the nicest visual feature of the trip. The water is very riffly, comparable to downtown Baraboo in some sections, which should warrant this trip as having occasional Class I. It’s not for nothing that it took me two hours to paddle an 8-mile segment (That and I wasn’t fumbling with a camera, because I’m a moron who should not be entrusted with gadgets). While still as narrow as the stretch upstream, it feels more open and less intimate. Bull pastures and corn crops do that to me. For better or worse, it’s less twisty than the upstream stretch and has fewer and less dramatic rock formations (which I personally love). But the swiftness of the river makes up for this. I’ve already been here before and will continue to return. Ideally, both of the Grant segments we’ve covered should be combined in one weekend with an overnight (or two) at Nelson Dewey State Park, which has some of the best car camping sites in the entire state. This way you get the best of what the Grant has to offer. I will be back next spring, when the buds begin to appear and wildflowers dot the bluffs and again in the peak of autumn foliage.